The Phantom breaks up a meeting for funneling Somara, a drug used by the former Wasaka tribe before the original Phantom ended their reign of terror. The current Phantom is drugged and sees Kua, The Undying One, and looking through the Chronicles later this wasn’t the first time, as other Phantoms have dealt with Kua seeing vengeance on the Ghost Who Walks. As the Phantom heads out of the skull cave, the supposed other jungle spirit is waiting. 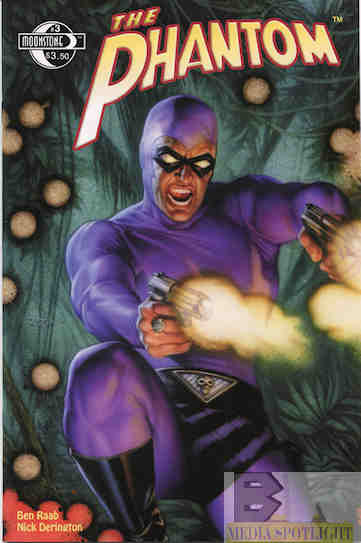 What they got right: I like the idea of a sort of “anti-Phantom”, an evil version following the same path (unless they actually go the paranormal route), giving the Phantom a real challenge with his own gimmick. The set-up is good I like the design for Kua, whom the first Phantom apparently imitated once to stop the Wasaka tribe’s evil. What they got wrong: I don’t have complaints on this one. Other notes: Since I’m catching up this answers a question I had about Him in a later story. The Phantom seemed to recognize him. Well, Him’s disguise is similar to Kua’s so now I get it. Recommendation: It’s starting to be a good story and we’ll see next time where it goes. It might be worth checking out if the ending’s good. Posted by ShadowWing Tronix on March 9, 2018 in Yesterday's Comics and tagged Kua The Undying One, Moonstone Books, The Phantom.